Secondhand SCIENCE is the brainchild — and possibly-other-organ-child — of Charlie Hatton. 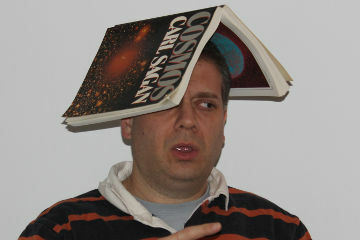 Charlie is a lifelong fan of science, even when he has to look up the big words in the back of the book. Or on Wikipedia. Or an old episode of Dexter’s Laboratory. Charlie has a degree in biochemistry, which should frighten everyone involved, and currently works as a bioinformatics programmer at an oncotherapeutics pharmaceutical company focusing on epigenetics. He has at least a tenuous grasp on what all of those words mean. After he looked them up. In his spare time, Charlie reads books — honest-to-goodness books… or, anyway, parts of books — on science topics from cosmology to quantum physics to neurochemistry. “Science is complicated. Very complicated. Like, setting-the-clock-on-the-microwave complicated. In fact, science is so complicated that even when someone really smart explains it, you may still be confused. I should know. I have a lot of personal experience with this. Yeah. This will totally go well. Secondhand SCIENCE is updated with a new topic every Sunday — whether the internet needs it or not. Outside of science, Charlie enjoys writing nonsense elsewhere on the web, pursuing personal transformation through cryptic notes left on random Post-Its and referring to himself in the third person in biographical blurbs. If there’s a topic you’d like to see covered — or you just want to tell me how many centuries I’m setting back the Enlightment movement with this nonsense — please leave a comment below or email me at secondhandscience@gmail.com.